Hello Parents! This month we will be discussing disciplinary strategies that—hey! Wait! Get back here, sit down, and read this! Just joking! But, all kidding aside, we know that everyone and their mother, yours included, has an opinion on how you should discipline your kid. Here at Tribeca Pediatrics, we believe that no one knows a child like their parent. Our aim is merely to provide you new and proven information on healthy and non-healthy discipline, and if you don’t like it, well, you can just go to your room, then. Humph! Disciplining a baby is a difficult concept for many parents to wrap their head around, perhaps because that is simply the wrong word. At this age you are merely setting the stage for appropriate behavior and boundary setting. After all, your tiny one is not intentionally doing “bad things”, they are just exploring their environment, and attempting to stick their fingers in the electrical socket, or grabbing your earrings is part of that. Yelling can scare a baby and inhibit their ability to learn and play freely by harming their feelings about themselves. If your baby does something dangerous or naughty, a firm “no” followed by a correct example is really your best bet. Depending on their age, it may go in one ear and out the other, but over time you’ll see your message stick. This is the age of ultimate boundary testing, and more than likely, your toddler’s favorite buttons to push are your own. This is a natural result of a child’s need to assert their individuality. That individuality, however, must be shaped by your guidance, however painful the battle, or your child is the one that will lose the war. When your toddler is acting up, the best approach is to keep it simple, short, and stern. Don’t engage in lengthy conversations or explanations about the outcome of your child’s behavior, and don’t attempt to distract them with another activity. These tactics will not alleviate bad behavior. If you have asked your child to do something, or more than likely, to stop doing something, and they don’t listen, simply remove the object of interest, or remove them from the object. 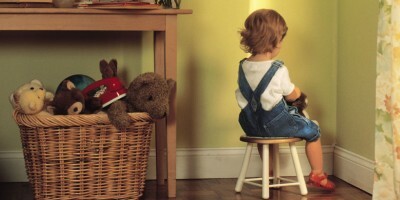 Placing your child in their crib for a “time out” is a great option. If you’re out and about, put them in their stroller for a few minutes. Whether they cry, play, or nap, it doesn’t matter. messages to your child, and gives unwarranted attention to misbehavior. Lavishing your child with affection when they are behaving well and denying it when they are not is a much healthier way of enforcing good habits than losing your top. When your child gets to be around the age of three, four, and five, behavioral problems start getting more serious. Many of these children are beginning preschool and kindergarten, and that’s when teachers, counselors, and sometimes even child psychologists get involved in the evaluation of your child. This can be a very scary time for the parents of little tykes who are having trouble dealing with authority and frustration. If you have found yourself in this situation with your child, the solution we have found most effective is very similar to the “time out” method. When a tantrum or disobedience erupts, put your child in their room alone for five minutes and let them deal with their anger, sadness, or whatever the emotion may be. Yes, things may get broken and it won’t be easy for you, but keeping your punishments simple, short, and stern actually helps build trust between you and your child. When a certain behavior leads to a predictable result, this, believe it or not, is comforting. When a parent yields to their child’s behavior or interrupts a time out for an explanation or apology, this sends a mixed message and can throw your child off balance. You probably got spanked a few times when you were a child. Your parents probably got spanked a lot more than that, and your grandparents, well, they may have even picked their own switch. Spanking and other physically inflicted punishments for children has a long history in our culture, and perhaps this is why it persists, “I got spanked and I turned out fine” being the reasoning behind the perpetuation. While spanking does yield immediate results, overwhelming scientific evidence asserts that this is only because your child is afraid, and will actually lead to emotional problems in the future, such as anger, aggression, and antisocial behavior. If we want to get very scientific about it, children who were frequently spanked (defined as at least once a month for more than three years) actually had less gray matter in certain areas of their prefrontal cortex, which is directly linked to depression, addiction, and other mental health disorders. So, yes, while you may have gotten spanked and “turned out fine”, we could and should be turning out “better” as generations go by, and exchanging spankings for “time outs” is one easy way to achieve this.